My prior 5 blog posts have been about taking a “small changes” approach to weight loss, so we can stop dieting for good. The changes are small, but it’s a pretty big mindset shift to handling food. We’re ready to move on to exercise now, and another mindset shift. I’d like to introduce you to the concept of nonexercise activity thermogenesis, or NEAT for short. The simplest explanation is “non-planned physical activities” – the calories burned while living our daily lives. Walking to and from our cars, fidgeting, typing, chewing gum, folding clothes, washing dishes, etc. Why should we care about all these non-planned activities? It has been said that prolonged sitting is just as bad for you as smoking. Not only is your body metabolically inactive while sitting, but we’re beginning to find out that your brain has a tendency to shut-down during extended periods of sitting as well. And if you’re concerned with weight-loss, NEAT can contribute to an additional 350 calories burned per day! How can we get more NEAT in our daily lives? I’ve got some really great ideas for you, and they can all be done in your work clothes at your desk. If you aren’t at work – it’s even easier to do them! Pick just one and commit to implementing it in your daily life (alarms on your phone make great reminders). Once you feel like it’s truly become a habit (anywhere from a week to a month), add another. Seated Cat-Cow Flow. While seated with your hands on your thighs, inhale and flex (arch) the spine, pushing your chest forward and up. Exhaling, move both hands toward your knees and round the spine, drawing your belly button toward your spine. Repeat. This helps to prevent lower-back pain and discomfort, common symptoms of sitting too much. Plank Pose. To increase focus and strengthen the entire body, practice plank anywhere: with hands or forearms on a desk and feet stepped back until you have created one long line from the top of your head to your toes. Keep your hands (or elbows) right under your shoulders, and the spine in neutral. Hold the pose for 10 seconds or more. If you have an opportunity to step away from your desk, try with hands against a wall or tree, or traditionally (on the floor). Dance helps the brain form new connections and work faster. It increases blood supply to the brain, fueling temporal and prefrontal brain activity responsible for memory improvement. So put on your favorite song and dance while seated or standing. Even just a vigorous few minutes of toe-tapping counts! Instead of reaching for a cup of coffee mid-afternoon, try a quick dance instead to get your blood pumping and brain working. March in place. 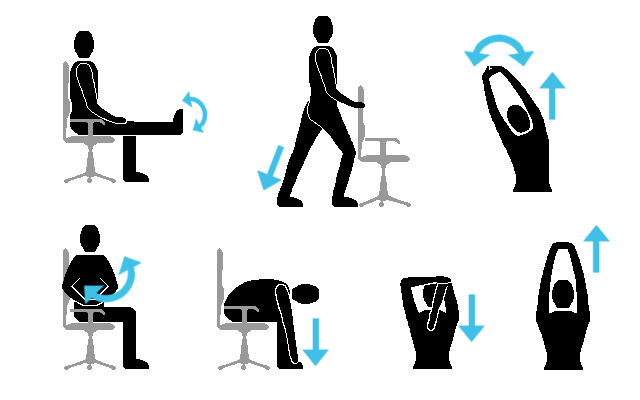 Whether seated or standing, fast or slow, for a few seconds or a few minutes – it’s all great! Try marching while standing whenever you’re on a phone call, or slow seating marching while in meetings (better yet, see if you can schedule a walking meeting). Do pushups and triceps dips at a counter, desk or wall; vary the hand width. Challenge a co-worker, neighbor, or house-mate to do them with you! Stand up and sit back down anytime you send an email. Go to the bathroom more often by drinking more water! Be sure to choose the furthest bathroom you reasonably can. Choose the furthest parking spot. It really doesn’t take that much more time to walk the extra distance, and you may even end up saving time by not having to circle or waiting for someone to vacate their closer spot. If you think of any more, post in the comments below! Maybe you’re the kind of person who just really prefers something a bit more guided. If so, I’ve created a little video for you. It’s just 5 minutes, but you should be able to add about 750 steps to your day, and it can be done in a very small space. Try ending your lunch break with this video to combat food-coma, or as a way to fight the mid-afternoon slump. Last but not least, it’s still important to be getting regular focused workouts in, too. In a perfect world, we’d all be getting cardio, strength, endurance, and flexibility work in weekly. So even if you start fidgeting up a storm at your desk, don’t stop coming to the studio for your classes or training sessions!